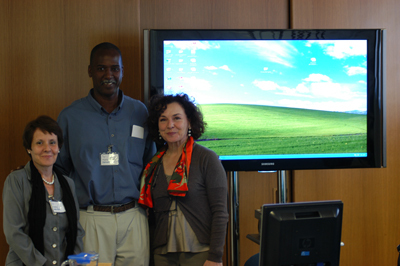 Dr. Ondina Leon Diaz, vice director of the Cuban National Center for Animal and Plant Health (CENSA), and Dr. Pastor Alfonso Zamora, epidemiologist, were guests at the Istituto "G. Caporale" di Teramo from 8-11 March 2011. The study visit was part of the ongoing joint project "The development of epidemiological systems for classical swine fever surveillance and risk analysis", with the objective of establishing the two institutions' future joint activities, especially in the area of animal welfare and vaccine technology. The visit included a seminar, during which Drs. Diaz and Zamora gave an in-depth presentation of the most important results of past and current research activities at CENSA.